Fountain Paint Pot is a giant mud pot in the Lower Geyser Basin, you can see the bubbling mud and the artistis palette of colors. 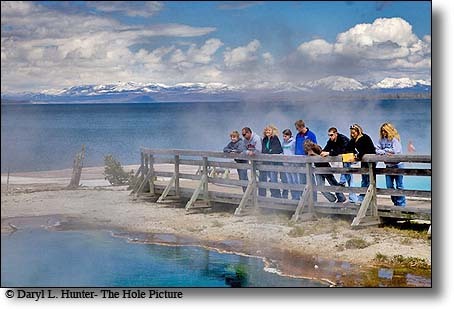 There are four types of thermal features in Yellowstone, geysers, fumaroles, hot springs and mud pots. more than 10,000 thermal features can be found In the park. 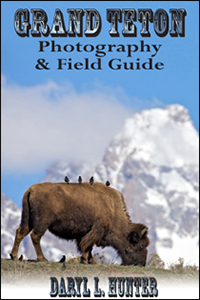 Yellowstone holds the planet’s most diverse and intact collection of geysers, hot springs, mud pots, and fumaroles hosting half of the earth’s geothermal features. Park visitors gaze into the depths of Abyss Pool in West Thumb Geyser Basin. Yellowstone Lake and the Absaroka Mountains are in the background. 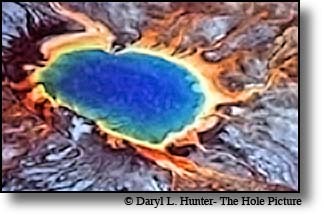 Yellowstone’s miles-deep groundwater flow systems tap magmatic heat sources then expand upward. As that hot groundwater rises toward the surface, it interacts with shallower, cooler groundwater to produce multi-phase mixing, boiling, and a huge array of different hydrothermal features. 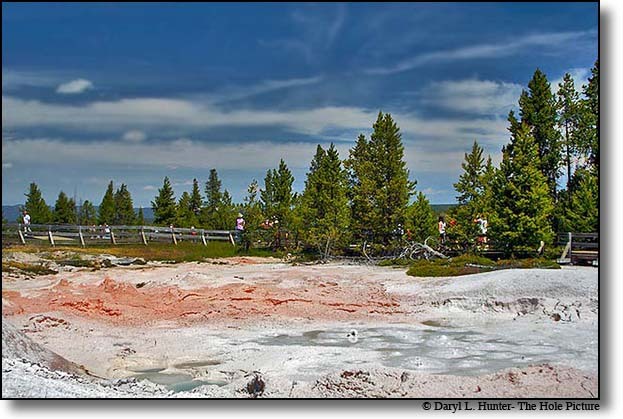 Yellowstone is a rhyolitic caldera that has produced 6000 cubic kilometers of ash flow tuffs, rhyolites, and basalts that form a poorly-characterized, dissimilar fractured rock aquifer, hosting both hot/deep and cold/shallow flow systems. Yellowstone’s Hot springs with names like Morning Glory, Grand Prismatic, Abyss, Emerald, and Sapphire, glisten like jewels in a host of colors across the park’s harsh volcanic plain. Radiating from a deep blue from the deepest and hottest part of the pools to orange at the parameter of the pool because of the thermophile bacteria that live there. Thermophiles are microorganisms that live and grow in extremely hot environments that would kill most other microorganisms. Thermophiles grow best in temperatures that are between 120 degrees and158 degrees. They will not grow if the temperature reaches 68 degrees. Where hot water is limited and hydrogen sulfide gas is present (emitting the "rotten egg" smell common to thermal areas), sulfuric acid is generated. The acid dissolves the surrounding rock into fine particles of silica and clay that mix with what little water there is to form the seething and bubbling mud pots. The sights, sounds, and smells of areas like Artist and Fountain paint pots and Mud Volcano make these curious features some of the most memorable in the park, sometimes for all the wrong reasons. A fumarole that comes up in a wet surface area can become a mud pot. As the steam bubbles up through the water, the hydrogen coming up with the steam reacts with the water to form sulfuric acid. This melts the surrounding rock to turn the water into a muddy clay. Mud pots bubble and can throw lumps of clay for some distance when they are active. Fumaroles are steam vents, are hot springs with a lot of heat, but so little water that it all boils away before reaching the surface so there is to little water in the system for neither a hot spring of a geyser. At places like Roaring Mountain, the result is a loud hissing vent of steam and gases. Geysers are some of the most unusual geologic phenomena in the world. They are incredible natural fountains that can shoot boiling hot water and steam hundreds of feet into the sky in violent eruptions. While most geyser eruptions last only a few minutes, some last for days. Some geysers almost never stop like Clepsydra Geyser in the Lower Geyser Basin on Fountain Paint Pot Trail. Others erupt violently, then stay dormant for years or even decades. There are two types of geysers, there is the "cone" style of geyser, and the there is a "fountain" type of geyser. 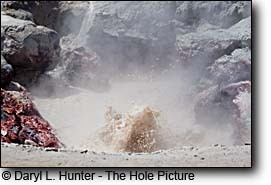 In a "cone" geyser, the geyserite has formed a type of nozzle near the surface. This tends to make the "cone" geysers erupt by sending a column of water to a great height. In a fountain-type geyser there is an open crater that fills with water before or during the eruption. These geysers produce an eruption where the water and steam come in bursts and water is sprayed around in all directions instead of creating a single column. Yellowstone’s 300 geysers make up two thirds of all geysers found on earth. A geyser requires three critical elements in order to form: a water supply, a heat source, and the proper kind of underground water circulation system. If only two of these three components are present, different features will form. For instance, if plenty of water is available but not much heat, a hot pool can form. If plenty of water and also plenty of heat exist, but not the proper kind of plumbing system, then a boiling hot spring commonly forms. What makes geysers rare and distinguishes them from hot springs is that somewhere, usually near the surface in the plumbing system of a geyser, there are one or more constrictions in a hot spring plumbing. Expanding steam generated from the rising hot water build up behind these constrictions, ultimately squeezing through the narrow passageways and forcing the water above to overflow from the geyser. Old Faithful is certainly the most famous geyser, is joined by numerous others in Yellowstone big and small, named and unnamed. The largest, Steamboat, the largest in the world, pulsates like a massive steam engine in a rare, but remarkably memorable eruption, reaching heights of 300 to 400 feet. It is known that geyser fields like the ones in Yellowstone National Park lie above what are called "hot spots." Hot spots are areas where a very hot mantle is rising beneath the Earth's crust. At shallower levels, the plumes partially melt to form basalt magma. Grand Parismatic Pool is the largest hot spring in Yellowstone. The oldest geyser in the world is believed to be Castle Geyser, which is located in the Upper Geyser Basin by Old Faithful. The size of its cone, in the shape that reminds people of a castle, indicates that it may be somewhere between 5,000 and 40,000 years old. Despite its age, Castle still gives spectators a good show by erupting every 10 to 12 hours for almost as long as an hour. 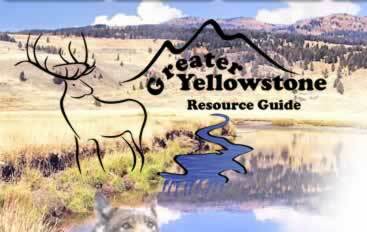 Geologically speaking, no geyser exists for very long, Yellowstone is a dynamic place and everything is always changing. 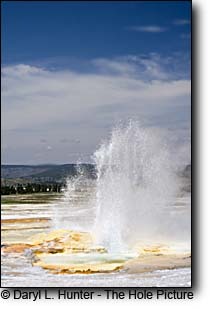 An example of this is Porkchop Geyser at the Norris Geyser Basin. Originally it was a small hot spring that occasionally erupted. Slowly geyserite sealed it closed with so that pressure build up and in 1985 it started erupting continuously. Pressure continued to build up so much that in 1989 it exploded. The explosion turned Porkchop back into a small hot spring that is now it working on sealing itself up again. Next to old faithful is a geyser cone that now is only a fumarole, it spews steam and nothing more but someday Old Faithful will quit and this fumarole may start up again. The park's thermal features lie in the only essentially undisturbed geyser basins left worldwide. In Iceland and New Zealand, geothermal drill holes and wells 2.5 - 6.2 miles deep have reduced geyser activity and hot spring discharge. Despite the proximity of roads and trails in the largest basins, few park features have ever been diverted for human use such as bathing pools or energy. 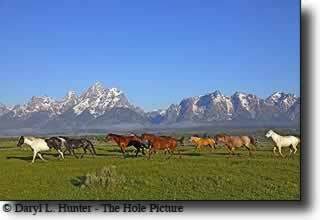 This is directly attributed to the foresight of creation of our first National Park in 1872. Legislative restrictions on geothermal development around Yellowstone, such as the Old Faithful Protection Act introduced in 1992, have failed to pass Congressional approval. Yellowstone’s vast collection of thermal features provides a constant reminder of the park’s recent volcanic past. Indeed, the caldera provides the setting that allows such features as Old Faithful to exist and to exist in such great concentrations.